روشندل کاهو, امین, نجاتی کلاته, علی. (773). تضعیف نوفه‌های اتفاقی در داده‌های لرزه‌ای با استفاده از تجزیه مُد تجربی. مجله ژئوفیزیک ایران, 5(2), 61-68. امین روشندل کاهو; علی نجاتی کلاته. "تضعیف نوفه‌های اتفاقی در داده‌های لرزه‌ای با استفاده از تجزیه مُد تجربی". مجله ژئوفیزیک ایران, 5, 2, 773, 61-68. روشندل کاهو, امین, نجاتی کلاته, علی. (773). 'تضعیف نوفه‌های اتفاقی در داده‌های لرزه‌ای با استفاده از تجزیه مُد تجربی', مجله ژئوفیزیک ایران, 5(2), pp. 61-68. روشندل کاهو, امین, نجاتی کلاته, علی. تضعیف نوفه‌های اتفاقی در داده‌های لرزه‌ای با استفاده از تجزیه مُد تجربی. 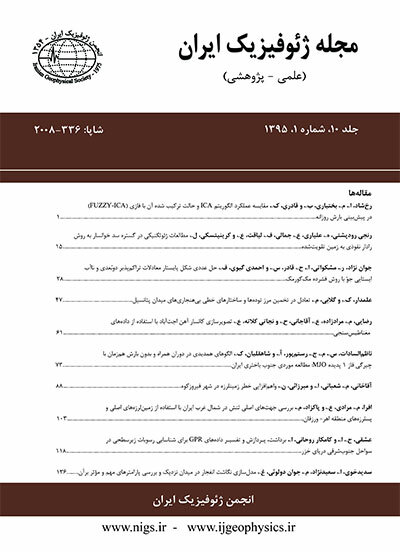 مجله ژئوفیزیک ایران, 773; 5(2): 61-68. تصویرسازی لرزه‌ای به‌شدت به کیفیت داده‌های لرزه‌ای وابسته است. تفسیر ساختاری و چینه‌ای داده‌های لرزه‌ای که حاوی کمترین میزان نوفه اتفاقی و همدوس باشند، به‌مراتب راحت‌تر است. نوفه‌های متعددی در داده‌های لرزه‌ای دیده می‌شود که دسته مهمی از آنها، نوفه‌های اتفاقی‌اند. تضعیف این دسته از نوفه‌ها، به‌‌خصوص زمانی که نسبت سیگنال به نوفه کم باشد، بسیار دشوار است. در این مقاله از روش تجزیه مُد تجربی برای تضعیف نوفه استفاده شده است. در این روش سیگنال نوفه‌ای به مولفه‌های نوسانی که تابع مُد ذاتی نامیده می‌شوند، تجزیه می‌شود. فرایند تضعیف نوفه شامل فیلتر کردن هر تابع مُد ذاتی و بازسازی سیگنال اصلی با توابع مُد ذاتی فیلتر شده است. نتایج به‌دست آمده از اِعمال روش روی داده‌های لرزه‌ای مصنوعی و واقعی، کارایی مطلوب روش پیشنهادی را نشان می‌دهد. The quality of seismic data varies tremendously, from areas where excellent reflections (or refractions) are obtained to areas in which the most modern equipment, complex field techniques, and sophisticated data processing do not yield usable data. Between these extremes, lie most areas in which useful results can be obtained. Seismic records are generally affected by various types of noise, such as ground rolls, multiples, random noise, and reflection and reflected refraction from near surface structures. Random noise resultiing from random oscillation during data acquisition is one of the most important and harmful noises that exists in seismic data over all times and frequencies. Many efforts have been made to remove this type of noise from seismic data. The predictive filter is an ordinary method commonly used for random noise attenuation from seismic data. This filter can be used in various domains, such as the f-x domain (Haris and White, 1997) and the discrete Cosine domain (Lu and Liu, 2007). Jones and Levy (1987) removed events which were not coherent trace-to-trace events by means of the Karhunen-Loeve transform. The empirical mode decomposition (EMD) method is an algorithm for the analysis of multicomponent signals that breaks them down into a number of amplitude and frequency modulated zero-mean signals, termed intrinsic mode functions (IMFs). An IMF must fulfill two requirements: (1) the number of extrema and the number of zero crossings are either equal or differ at most by one; (2) at any point, the mean value of the envelope defined by the local maxima and the envelope defined by the local minima is zero. In contrast to conventional decomposition methods such as wavelets, which perform the analysis by projecting the signal under consideration onto a number of predefined basis vectors, EMD expresses the signal as an expansion of basic functions that are signal-dependent and estimated via an iterative procedure called sifting. Apart from the specific applications of EMD, a more generalized task in which EMD can prove useful is signal denoising (Kopsinis and McLaughlin, 2009). When EMD is used for denoising, the problem is to identify properly which IMFs contain noise characteristics. Certain modes will consist mainly of noise, whereas other modes will contain both signal and noise characteristics. In the case of white Gaussian noise, the noise-only energy of the modes decreases logarithmically. The first mode, carrying the highest amount of noise energy, will consist mainly of noise, and the effect of noise should gradually weaken with higher modes. In this paper, a new signal denoising method based on the empirical mode decomposition framework is used to suppress random noises in seismic data. A Noisy signal is decomposed into oscillatory components (IMFs). The empirical mode decomposition denoising method involves filtering each intrinsic mode function and reconstructing s the estimated signal using the processed intrinsic mode functions. The direct application of wavelet-like thresholding to the decomposition modes is, in principle, wrong and can have catastrophic consequences regarding the continuity of the reconstructed signal. This arises as a result of the special attributes of IMFs; namely, they resemble an AM/FM modulated sinusoid with zero mean. Consequently, we used the interval thresholding method instead of direct theresholding method to denoise seismic signal. the efficiency of the proposed method was tested on both synthetic and real seismic data. In every case, results show that the denoising algorithm can suppress random noise significantly.